American television host, actress, producer, philanthropist. 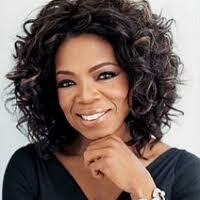 Oprah Gail Winfrey was born January 29, 1954, in Kosciusko, Mississippi. After a troubled adolescence in a small farming community, where she was sexually abused by a number of male relatives and friends of her mother, Vernita, she moved to Nashville to live with her father, Vernon, a barber and businessman. She entered Tennessee State University in 1971 and began working in radio and television broadcasting. In 1976, Winfrey moved to Baltimore, where she hosted the TV chat show, People Are Talking. The show became a hit and Winfrey stayed with it for eight years, after which she was recruited by a Chicago TV station to host her own morning show, A.M. Chicago. Her major competitor in the time slot was Phil Donahue. Within several months, Winfrey's open, warm-hearted personal style had won her 100,000 more viewers than Donahue and had taken her show from last place to first in the ratings. Her success led to nationwide fame and a role in Steven Spielberg's 1985 film, The Color Purple, for which she was nominated for an Academy Award for Best Supporting Actress. Winfrey launched the Oprah Winfrey Show in 1986 as a nationally syndicated program. With its placement on 120 channels and an audience of 10 million people, the show grossed $125 million by the end of its first year, of which Winfrey received $30 million. She soon gained ownership of the program from ABC, drawing it under the control of her new production company, Harpo Productions ('Oprah' spelled backwards) and making more and more money from syndication. In 1994, with talk shows becoming increasingly trashy and exploitative, Winfrey pledged to keep her show free of tabloid topics. Although ratings initially fell, she earned the respect of her viewers and was soon rewarded with an upsurge in popularity. Her projects with Harpo have included the highly rated 1989 TV miniseries, The Women of Brewster Place, which she also starred in. Winfrey also signed a multi-picture contract with Disney. The initial project, 1998's Beloved, based on Pulitzer Prize-winning novel by Toni Morrison and starring Winfrey and Danny Glover, got mixed reviews and generally failed to live up to expectations. Winfrey, who became almost as well-known for her weight loss efforts as for her talk show, lost an estimated 90 pounds (dropping to her ideal weight of around 150 pounds) and competed in the Marine Corps Marathon in Washington, DC, in 1995. In the wake of her highly publicized success, Winfrey's personal chef, Rosie Daley, and trainer, Bob Greene, both published best-selling books. Chicago, IL - On Monday February 7, 2011, The BOSS Network (Bringing Out Successful Sisters) will launch its first ever documentary series entitled “Behind the Business - A Real Look At Women in Leadership,” scheduled to air online only at www.thebossnetwork.org. Having committed themselves to changing the way women, as enterprises are viewed amongst the masses, the BOSS Network Founder Cameka Smith was compelled to executively produce a film that highlighted real women leaders. This powerful documentary, which is directed by Mark Tutson, CEO of 3188 Films, will discuss the negative portrayals of female imagery in today’s media and express the importance of nourishing positive interactions among women in business. Filmed onsite at seven Chicago based establishments; cameras have captured candid expressions and opinions from female leaders on controversial topics such as, “How do they feel women are portrayed in leadership in the media?” and, “What do you think about the stereotype that women do not support each other in business?” The documentary also sheds light on “Why it is important to showcase women leaders to our youth”, all the while offering words of encouragement to blossoming entrepreneurs. The "Behind the Business" documentary special will also serve as a prelude to the BOSS Networks upcoming addition, the "Project BOSS"; which is a mentorship program established to help teach young girls leadership skills such as public speaking, self-esteem, etiquette, and entrepreneurship through workshops and events. “Project BOSS” is due to launch in June 2011. Featured in this film are Shay Atkins- CEO of Creative Turkey, Dartesia Pitts- Attorney at Law, Maya Broussard and Chrishon Lampley- Owners of Three Peas Art Gallery, Siobhan Strong- Co-Owner of Deliciously Vintage, Heather Williams and Deanna Morales- Owners of Glam Luxe, Querida Flores and Ruckiya Ross- Owners of August Bloom (Haute Floral Design), and Danielle Wideman- Founder/Editor and Chief of Goddess Girl Mag. The BOSS Network was founded by Cameka D. Smith and is a women professional networking organization dedicated to highlighting, connecting, and empowering women to promote their business while creating opportunities for growth through networking beyond events. In 2010, Forbes.com named BOSS amongst the Top 100 Websites and one of the 10 Best Career Sites for Women. 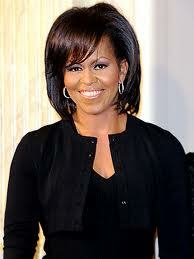 First lady, lawyer, Chicago city administrator, community outreach worker and wife of U.S. President Barack Obama. Michelle LaVaughn Robinson Obama was born January 17, 1964, in Chicago, Illinois. Michelle was raised on Chicago's South Side in a one-bedroom apartment. Her father, Frasier Robinson, was a city pump operator and a Democratic precinct captain. Her mother, Marian, was a Spiegel's secretary who later stayed home to raise Michelle and her older brother, Craig. The family has been described as a close-knit one that shared family meals, read and played games together. Craig and Michelle, 16 months apart in age, were often mistaken for twins. The siblings also shared close quarters—they slept in the living room with a makeshift sheet serving as their room divider. Both children were raised with an emphasis on education. The brother and sister learned to read at home by the age of four, and both skipped second grade. Following law school, Michelle worked as an associate in the Chicago branch of the law firm Sidley Austin in the area of marketing and intellectual property. There in 1989, she met her future husband, Barack Obama, a summer intern whom she was assigned as an adviser. "I went to Harvard and he went to Harvard, and the firm thought, 'Oh, we'll hook these two people up,'" Michelle said. "So, you know, there was a little intrigue, but I must say after about a month, Barack…asked me out, and I thought no way. This is completely tacky." Initially, she refused to date Obama, believing that their work relationship would make the romance improper. Eventually she relented, and the couple soon fell in love.